In the Winter we can only dream of this. My house smells like tomatoes. Roasted tomatoes, to be exact. For the past week, fresh, ripe, sweet tomatoes have followed me around. From the farmer’s markets in Kotka and Hamina to the local grocery store; from favorite blogs to cookbooks; in my own garden – I’ve had tomatoes on my mind. 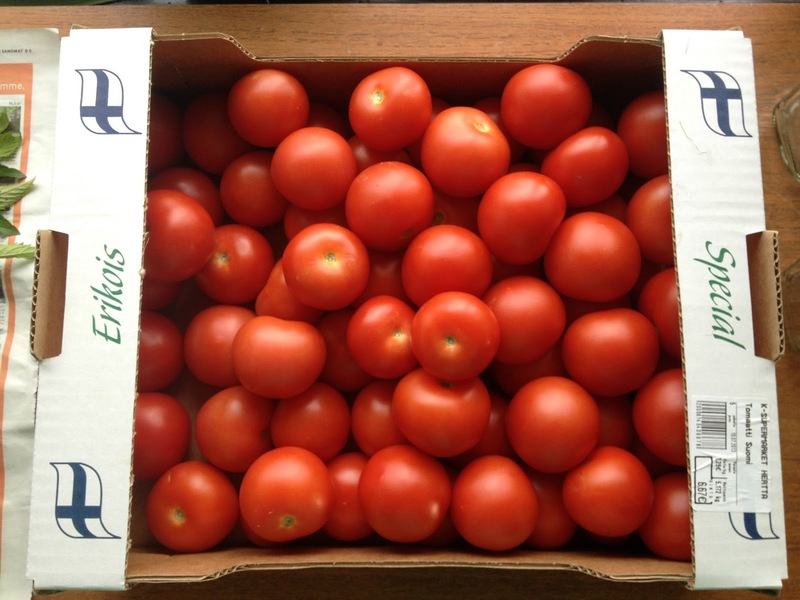 So when I came across fresh Finnish tomatoes being sold for €1.29 per kilo, and discovered that they were selling them in 5 kg boxes, I gleefully grabbed one and marched on home, dreaming of canning and jamming and stewing them for sauces and salsas and spreads. All great ideas to be sure, but there is something much easier and so tasty, that the the first 5 kg box was quickly followed by another 5 kg box, marching steadily down the same path via the oven and into the freezer. I have talked about these before. It’s what I do with tomatoes in the winter – when I desperately want the flavor of tomato, but the watery, flavorless versions that grace supermarket shelves in the winters just simply don’t satisfy. Somehow the roasting takes away the sad blandness of a winter tomato and transforms it into something that elevates the recipe into which it’s being added. And then: I started researching for those salsas & sauces. Inevitably, Google led me to Food in Jars, that wonderful website for all things that can be preserved in a glass receptacle with a lid. 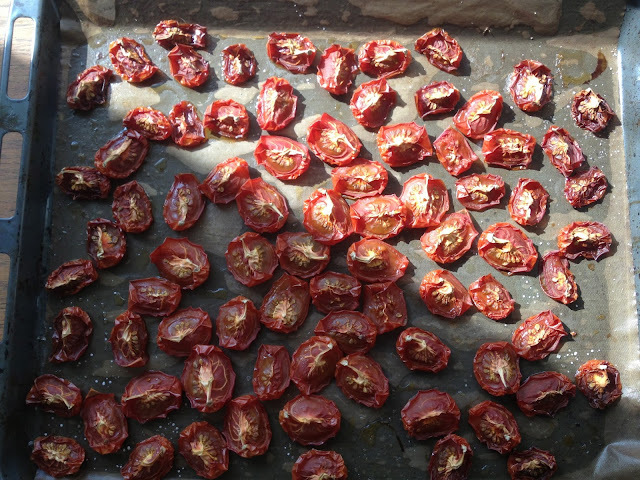 Marissa shared that one of her favorite ways to preserve tomatoes is to Roast and Freeze! Why hadn’t I thought of this before? The recipe is so easy it’s hardly a recipe at all. But it needs to be here, because the next few posts on this blog are going to include recipes using roasted tomatoes, so we’ll be needing them soon. Marissa suggests an overnight method: cut the tomatoes, and salt and oil, put them in the oven overnight at 200°F/95°C and wake up to something glorious. So that’s what I did. With 10 kg of tomatoes. That’s a lot of tomatoes. They are finally done. I have now opened all of the windows to let the warm summer breezes take care of the lingering perfume of roasted tomatoes. As for the tomatoes themselves, we’ll be working through those in the dark months of winter. It’ll be no problem – you see, I’ve been practicing already. The first thing that happened was J ate a handful directly off of the pan. That’s a good sign that we’re moving in the right direction. The next 10 or so went into omelettes, snuggled up next to goat cheese (recipe to follow – sorry to tease!). Then a shy cup tossed into a risotto with fresh mozzarella (another recipe coming). Then I start to dream of putting them in sandwiches. Toasting a fresh slice of ciabatta and topping it with a slice of good cheese and these tomatoes. Making a tart and layering these tomatoes over the top just before it goes into the oven. Tossing them into pasta with a little fresh parmesan and some chopped fresh herbs. I’m getting hungry. I think I’m gonna need another 10 kg of beautiful summer tomatoes. Early morning sunlight. Roasted Tomatoes. Happy Day. based on the method suggested in Food in Jars. Heat your oven to 200°F/95°C. Slice the tomatoes into quarters, or if they are small, in half. Arrange them cut side up on a parchment-lined oven tray. Sprinkle them lightly with salt and drizzle olive oil over the top. Put them in the oven, shut the door. Go to bed. Sleep well. Wake up to the most wonderful smell of roasting tomatoes. The best thing to do is put these in the oven right after dinner – say 6:00 or 7:00. That way, 10 – 12 hours later (yes, that’s how long it takes, but remember – you’ll be sleeping through most of it) when you are waking up, they’ll be done and you won’t spend the day peeking into the oven to check their progress and driving yourself crazy. 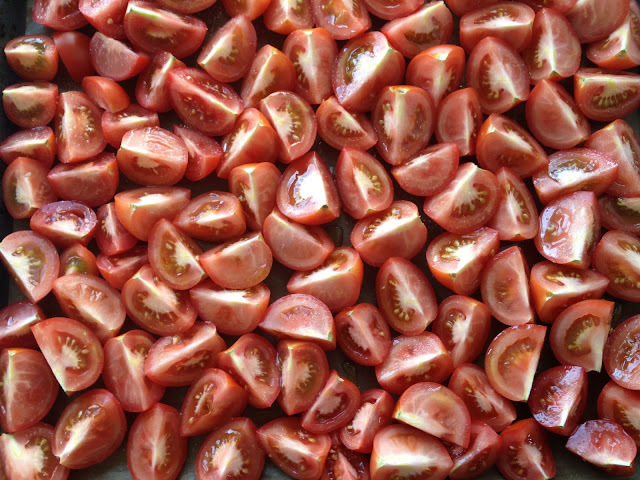 Once the tomatoes are done, remove them from the oven and allow them to cool on the countertop. Once they are cool – transfer them to large plates or trays, or if your freezer is large enough, place the pans into your freezer to allow the tomatoes to partially freeze (or thoroughly if you have something else to do and need to come back to them later). Transfer the semi-frozen or frozen tomatoes to labeled Ziplock / MiniGrip bags and return to the freezer. The reason I do this is to prevent the tomatoes from freezing together in one solid mass. This way, I can take 2 or 20 out of the freezer as suits my recipe without needing to thaw a whole bag. 5 kg of tomatoes yields 3 one-liter / -quart bags.